VATICAN CITY (CNS) — Unity and fidelity are indispensable cornerstones of Christian marriage, Pope Francis said. Having two people generously come together as one and pledge lifelong faithful love must be not only “adequately explained to future newlyweds,” these values also require the pastoral care of the church’s ministers and members, the pope said, addressing members of the Roman Rota, a tribunal handling mostly marriage cases. In fact, married couples who live their marriage “in generous unity and with faithful love” are “a precious pastoral help to the church” and offer everyone “an example of true love,” he said Jan. 29 in an audience marking the inauguration of the Vatican court’s judicial year. “So that it may be a valid agreement, marriage requires that a full unity and harmony with the other be established in each future spouse so that, through the mutual exchange of their respective human, moral and spiritual riches — almost like communicating vessels — the two spouses become one,” he said. Unity and fidelity are not only the “two fundamental cornerstones” of marriage, but of the church of Christ itself, he said. Pope Francis said couples need “triple preparation” that is “remote, proximate and permanent” so that they may grow in awareness of the values and commitments pertaining to marriage. 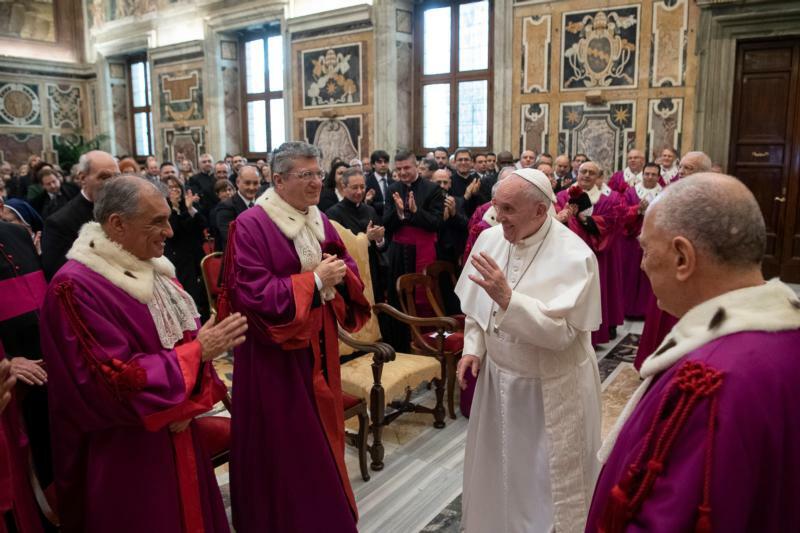 “This is the news that should also make the faithful and loving evangelical ministry of bishops and priests stronger and more consoling,” he said.